Even though Spring hasn't quite sprung here in NJ, I can't help but be giddy with excitement because Spring means one thing to me. Baseball season has officially begun. Luckily my husband is a huge baseball fan too. We fit together like 2 peas in a pod. I really enjoyed writing it and it's a great read for any baseball or sports fan... or even someone who had something amazing influence their childhood like I did. I love baseball season! I got Sophia a rangers shirt and made her a matching Rangers bow! Yay!! Yankees fans!! You have no idea how difficult it is to be an ex-NYer living in Sox country. I used to be able to get the BEST seats through my old job...my firm had box seats. Then I 'retired' and moved north. Stopped to say hi..I haven't visited in a while. Your little Julianna is getting so big!! Never got into sports myself... but the kids seemed to be dressed in gators (my sister) and dolphin (the hubby)outfits- to me they just look cute in them... and they never correspond to the correct sport season- oopsie. 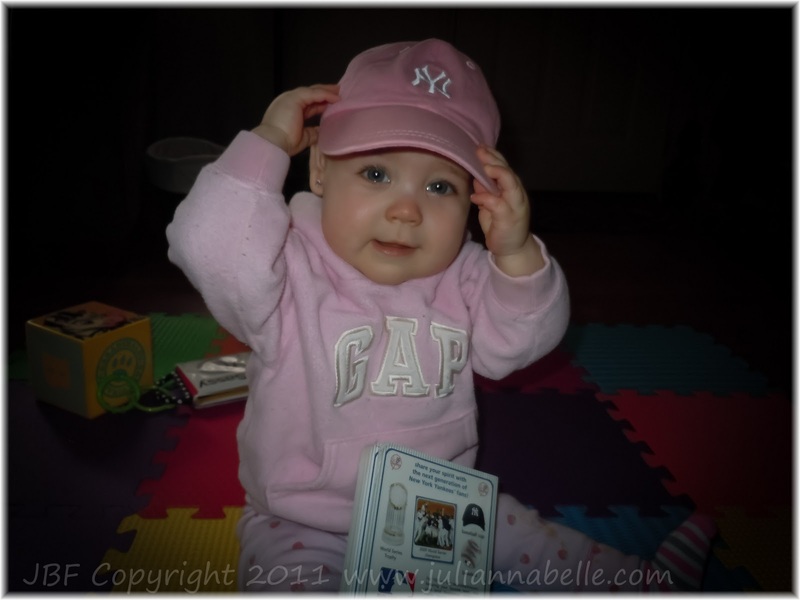 Julianna looks adorable in her pink Yankee's hat... she is holding it perfectly! Short Leg Lucy - i love baby gap stuff, especially their sweatshirts! I think they last and are worth the money! :) Go for it!